3) the conversion of leaves into spines, which protect the stored water. These changes did occur and are important, but numerous other changes occurred during cactus evolution, changes in almost every aspect of plant biology. Epidermis: Before leaves could be reduced or lost, the stem had to become a photosynthetic organ, which means that its epidermis had to become a persistent tissue with a high density of stomata. The guard cells of these stomata must function for years rather than just a few months as is true of guard cells in deciduous, short-lived leaves. Because the succulent cortex of a cactus is crucial to desert survival, it must not be shed once bark formation occurs, so an unusual feature of cacti is that they produce a cork cambium only after they have become extremely old, and that cork cambium arises from the epidermis, not from cells in the cortex or secondary phloem as is typical of other plants -- this surface location ensures that the cortex is retained forever. Pictured here Trichocereus terscheckii, and its green color indicates that living epidermis is present on all parts of its stem, even parts that may more than one hundred years old. Do these cells synthesize cutin for decades? Cortex: It is easy to take for granted the thick cortex of cacti, but it is unique -- no other group of plants has such a thick cortex. Other succulent plants store water in parenchymatous wood or they are monocots with a network of vascular bundles. The cactus cortex is able to be so thick because it has a system of cortical bundles that transfer water, minerals and organic nutrients throughout its extensive volume. The cortex also needed modifications that allow it to be photosynthetic; for it to swell and contract without tearing apart; and to have water-storage cells that give up water to photosynthetic cells (parts of the cortex dehydrate while other parts remain completely turgid). Leaves: All cacti still produce leaves, some have remarkably large, ordinary leaves, most have only microscopic leaves (but these have stomata, xylem and phloem). The loss of leaves not only reduced the surface area through which cacti lose water, it eliminated the extensive network of leaf veins through which water is unloaded from xylem. Now, most cacti must unload water from vessels in wood -- but in ordinary plants, wood vessels merely transport water, they do not unload it into parenchyma. Spines: We are all painfully familiar with one of the functions of cactus spines, but look at the image of spines of Mammillaria plumosa on the Leaves webpage -- they are feathery enough to shade the plant from excess sunlight but they are too soft to deter any animal from eating the cactus. The spines of Coryphantha clavata are now extra-floral nectaries that secrete sugar water. Spines of some tephrocacti are thin and flat -- they mimic blades of dry grass and help hide the cacti. 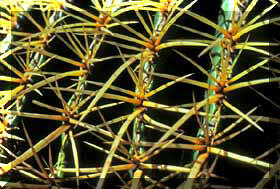 Pictured here are protective spines of Echinocactus grusonii. Poisons: No cactus is really poisonous, but peyote has interesting alkaloids, and most cacti have mucilage that would keep you from trying to get water from the cacti even if you were dying of thirst. Wood: Cactus wood transports water, and in some plants it also supports the plant's weight. 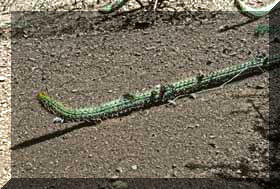 But globose cacti such as barrel cacti are supported by their turgor, not by wood. 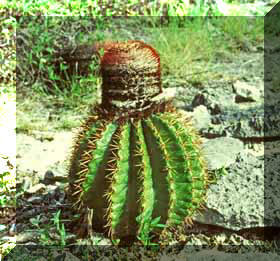 In many cacti, wood fibers have been reduced or eliminated and instead the quantity of water-storage parenchyma is very high. Most cacti also have a cell called a wide-band tracheid -- it is so elastic that as drought causes the volume of water in the wood to decrease, the wide-band tracheids shrink to a smaller volume to match -- a cell cannot cavitate if its volume shrinks to match that of the water within it. 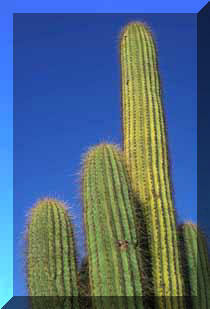 Pictured here is Trichocereus thelogonus -- it obviously does not use its wood to support itself vertically. Root succulence: Most cacti store water in the shoots, adjacent to the photosynthetic cortex, but a large number of cacti have succulent roots -- water is stored underground where it is out of sight of thirsty animals, is cooler than in the air, its weight doesn't have to be supported, and so on. Succulence in cactus roots is completely different from that in cactus stems -- roots have parenchymatous wood only, shoots have a voluminous cortex. 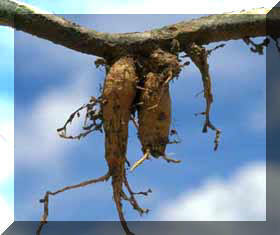 Pictured here are succulent adventitious roots of Monvillea spegazzinii. Apical meristems: As branches became more succulent and heavier through evolution, the number of branches per plant was reduced. Many cacti now have just a single stem with only one shoot apical meristem. Whereas an ordinary tree is constructed by the activity of thousands of shoot apical meristems, cacti are produced by just a few or only one. That means that the number of cell divisions that each cactus apical meristem cell must undergo could be very high -- this would lead to increased risk of mutations. Cephalia: When some cacti become old enough to flower, their growth form changes so dramatically that most people assume the plant is two separate species (or two genera) grafted together. Take a look at the images on the Cephalia webpage to be truly amazed. The image here is Melocactus intortus: the green basal part is the juvenile (while growing like that for years, the plant was unable to flower), the upper red part is the adult phase, the cephalium. Once the plant switches to adult, all further growth is as cephalium -- the cephalium will become longer but the plant will not make any more photosynthetic tissues. The cephalium differs from an inflorescence in that it is perennial and permanent whereas inflorescences are temporary and new ones are produced each year in perennial plants. 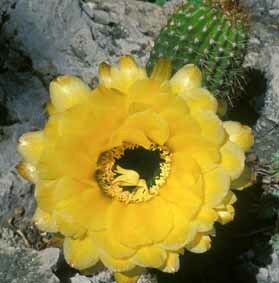 Flowers: Cactus flowers are inside out -- they are hollow tubes with petals at the top, stamens inserted on the inside of the tube (with "lower" stamens above "higher" stamens) and with carpels at the very bottom. Not impressed? The whole thing is embedded in shoot tissue -- shoot tissue that bears true leaves (they may be called bracts, but these are real leaves). Notice that in this image of Trichocereus lamprochlorus, we are looking down into a hollow tube-like flower, the stamens are attached to the inside of the tube and the carpels are at the very bottom.